Hi everyone! 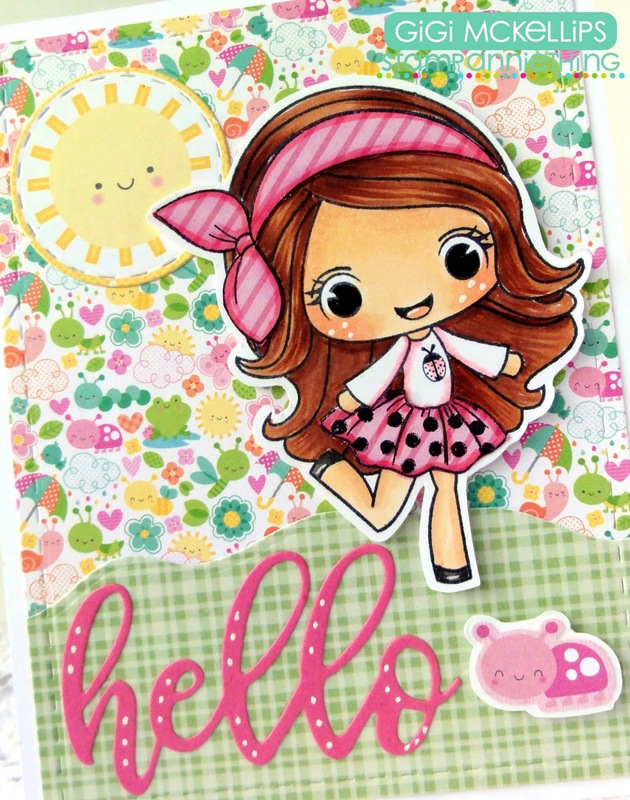 This is Tina from The Scrappin Rabbit blog and today I have a card to share using the adorable Kelsey-Believe stamp set. Here is a pic to try and show how sparkly her wings and flower garland are. 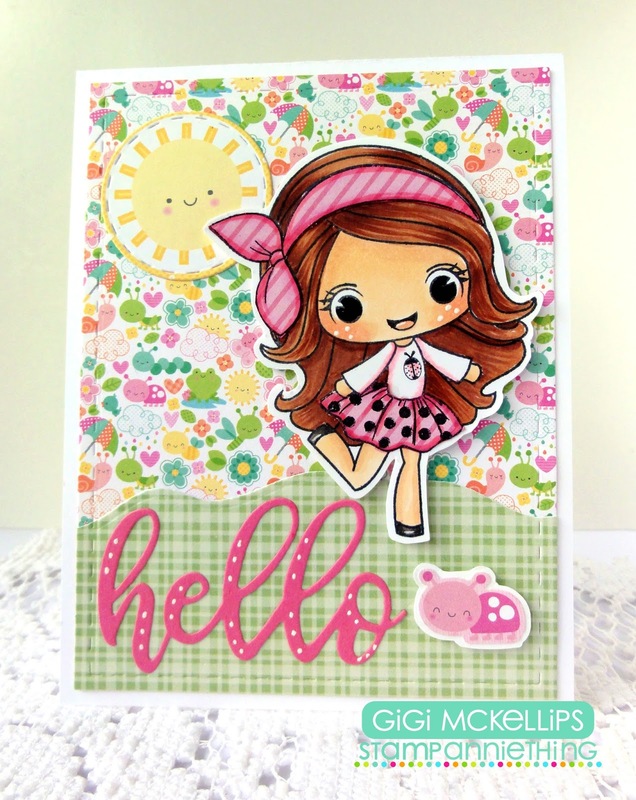 I used the Danielle-Springtime stamp set to create my card. Since it's still technically Spring, I though Danielle would make a super cute card! I added the grass layer cut with the SAT Under The Sea Metal Dies and the "hello" using the Hello Metal Die. I stamped and half paper pieced/half colored Danielle with Copic markers. I gave her freckles and dotted the Hello with a white gel pen and added her to the card on pop dots. To finish, I hand cut the lady bug and cut the sun with the Stitched Circle Dies from a Doodlebug paper pad. Hey Friends! Stephen here and today I am excited to share a card that features the new digital image, "Karaoke Kimmie". This digital stamp, along with a new die (HB2U Music Die) and stencil (Music In Me stencil) from Stamp AnnieThing, will be part of the latest Color With Me class which I will be doing tonight at 7pm EST live in the Stamp AnnieThing Stampers Facebook group. Hello everyone:)Eunji here.Today I am making the sea theme card.Let's look at my card. I started stamping a mermaid lady image stamp on maker paper from Waving Hello set. 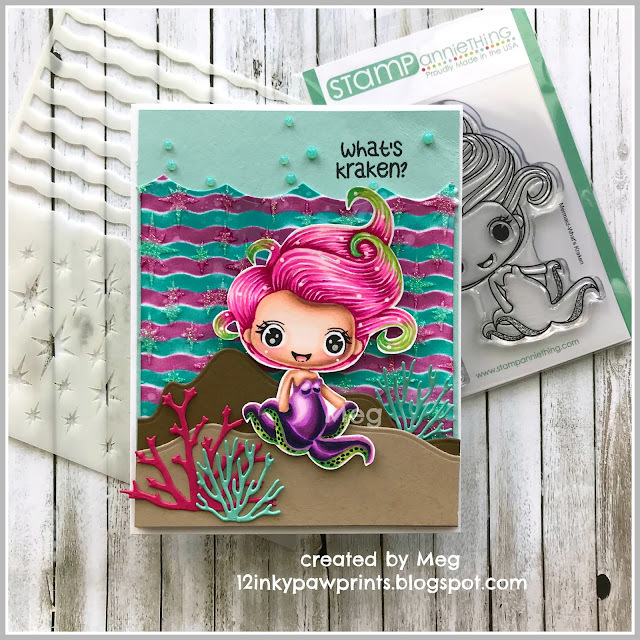 And stamped a coral reef image stamp from Sending Oceans of Love set and colored in the same way as mermaid. Next blended a background on A6 size card stock with Distress ink. And one more blended a card panel with Wavy Circle Trio stencil. Lastly added the mermaid and coral reef image paper piece on card panel with foam tape and stamped a star stamp all around. Stamp Anniething "Felicity - What's Cooking?" Hello everyone! It's Meg here today from Twelve Inky Pawprints! I've been honored and delighted to guest design for SAT this month, and this is my final project to share with you. There have been a LOT of luscious products released recently, so I tried to use a bunch of them on this card to inspire you. For my design, I used an A2 card base, and layered my blue background paper, topped with my water. I created the water out of the brand new Stars and Stripes stencil, ink, and some glitter paste. I also cut my water with the Waves Dies. Then, I cut some awesome sea shapes out of the Under the Sea Dies, and plopped my chubby and cheery little octopus girl right in the center. My octopus is the Whats Kraken stamp. Thanks everyone for your encouragement this month as I've guested! Hugs! 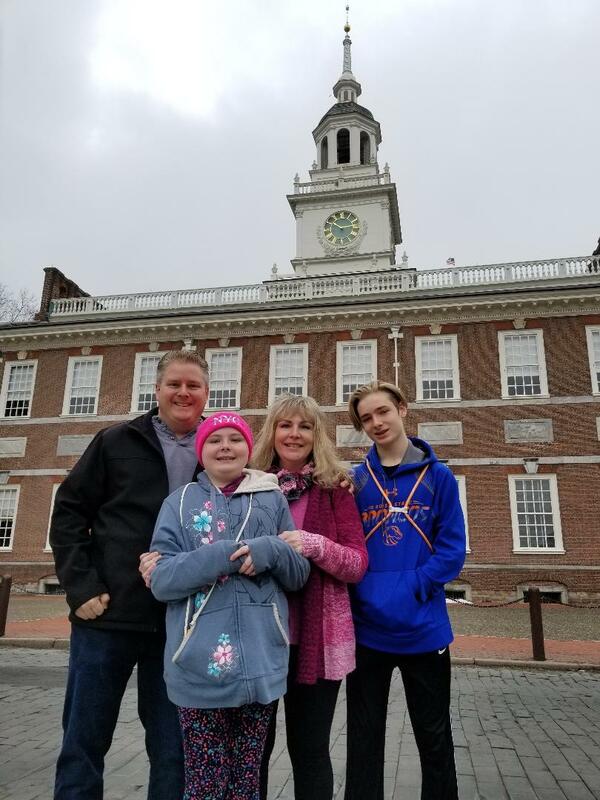 I am married and have 2 wonderful kids, Mitch 15 and Madison 12 who keep me busy if I’m not crafting! We also have a cat, Milo, who likes to “help” me craft as well as a box turtle Tuck and fish Hobbes. When &amp; how did you first get into crafts (general)? I have been doing all kinds of crafting my whole life, loved art time in school the most!! Got into tole painting in my 20’s which has transformed into coloring, just using a different media. When &amp; how did you first get into card making specifically? In 2003 we moved to the States from Canada and I started going to Stampin’ Up Classes to meet people and learn. It took off from there and I became a design teacher, started a Blog in March of 2009 and now I’m on 4 amazing design teams!! I love creating!! I enjoy the creative process and using new supplies and techniques. I think my style is cute and simple. Copics, Die Cuts and Pattern Papers. I love making scrapbook layouts of my kids!! I also make treat/gift items to give away and some home décor items. I love watching my kids play sports, enjoy bike riding and as a family we play Pokémon Go! I started coloring after watching a brief video on how to blend with copics. After that I’ve just been practicing and learning color combos off of Pinterest. Stamp Anniething Stamps! They are too cute!! I start with my image, pick out papers to go with him/her, design card layout and then color the image to match with card design. Use a color chart from Pinterest. Practice, Practice, Practice. The more you color the more you’ll get better. I’m a Breast Cancer Survivor and paper crafting really helped me get through the rough times. I love them all!!! Each one that comes out becomes my favorite…lol!! Paper…Paper…and more Paper!!! Plus my Silhouette Cameo…. Here is my card for today using Samantha ~ Make your own Rainbow. I love that she is holding a copic pen and designed my card around to look like she wrote the "hello". The new dies are so awesome they even cut foam which is what I did to raise up the hello die cut on the card.